A maker is always sensitive to new and funny things. One day, I watched a video in which a sunflower moves along with the sun. I had a sudden insight then. Why can't I make an electronic device imitating this biomechanism. So I redid this project and made a specific tutorial to help more people make it. Here we go. The materials we need are listed below. Firstly, we need to cut two pieces of cardboard as the pictures shows, just for two halves of a piece cardboard. Then the pieces of cardboard can be assembled into a cross shape. At last, paste the stick with the cross, it will play a role as "head", and always point to the sun. On the other hand, it can make the device beautiful and stable. Pierce 4 suitable holes into Styrofoam to install the 4 sensors, then dig one mid-hole to thread the stick. I numbered these sensors so that we can distinguish their different placements. Use the glue gun to fix the stick to the foam, and then plug the cables into the sensors. We fix the stick to the pan-tilt. The seat of the sensor should keep consistent with the picture. Sensor “1“ and sensor ”2” located below site. The pan-tilt is an assembled device with 9G servos. It can control the vertical and horizontal rotation with 180 degrees. Take out the Crowduino and Crowtail- Base Shield, then stack them together. Before we start to connect the cables onto the base board, we need to upload the program code into Crowduino, a micro USB cable is necessary. 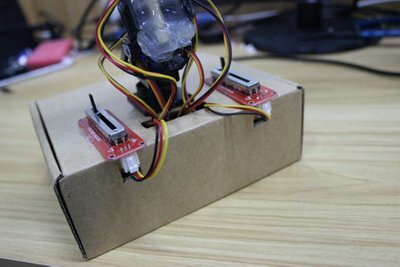 Connect the Crowduino to the computer, and open the Arduino IDE. Now we can start connections. First connect the cables of sensors to the shield, with the numbers corresponding one-to-one as the above picture shows. Connect two potentiometers to the A4 and A5 sockets of the shield. 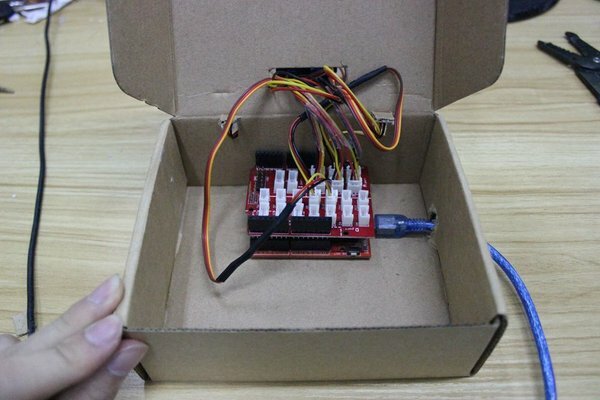 There is no difference between the two potentiometers, but you should know that whichever one is connected via the A4 port will serve the role of controlling the delay of reaction time, and A5 for servo rotational speed. The down servo (horizontal movement) connects with D9, and the up servo (vertical movement) connects with D10. The Crowduino is the main controller board of this project. We can power this board with a USB power bank or a DC adapter, it depends on you whether it is to be a mobile device or a fixed device. Step 11: Have a Try! Now, close the box. It seems that it can't wait to chase the sunlight. OK, take it easy, baby, let's have a test for you now. I took it to a dark room, then opened the phone flashlight, and WOW! Look at this cute guy! It looks difficult but is actually quite simple, so just do it! And you can help make it look more powerful and cool!